HowTo reach the Astronomical Institute. Slovak Republic is situated in central Europe. It has three major airports: Bratislava, Poprad, Košice. There are other two conveniently located airports, the airport in Vienna (some 60 km from Bratislava) and Krakow-Balice. 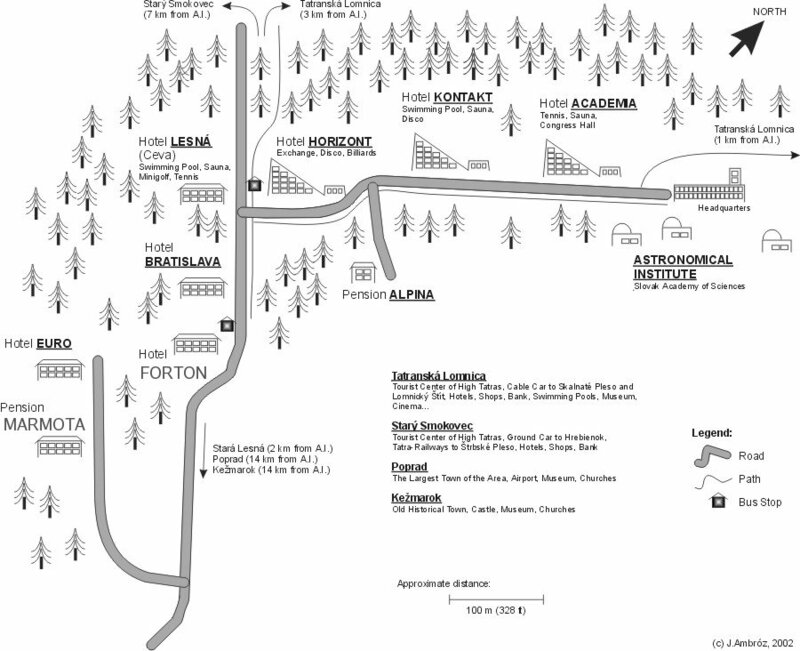 Astronomical Institute is located in the norhern part of Slovakia, close to the frontier with Poland, being only 20 km from Poprad, the biggest town in the area easily accessible by train, bus or plane. From Poprad go to Tatranská Lomnica, the closest village to the Astronomical Institute. You can get to Tatranská Lomnica from Poprad by bus or by train via Starý Smokovec or Studený Potok (Veľká Lomnica). The Institute is about 2 km from the Tatranská Lomnica railway station. To get to the Institute take and follow a forest lane/path between Kremenec and villa Alexandra. In case you have a heavy luggage we recommend to take a taxi from Poprad or Tatranská Lomnica to the institute. From Krakow airport you can also take a taxi or bus to Tatranská Lomnica. The time tables of buses and trains can be found at: cp.sk or jizdnirady.cz. You can check our location in an arbitrary detail using OpenStreetMap. You can use the larger map version (link bellow) as a route planner as well. This picture gives you a schematic view of surroundings of our Institute. Back to Astronomical Institute home page.